Road runners is in full swing at Jimmy Brown Elementary School. The program started to help get younger students out exercising while having fun. It is held after school one day a week for students in 2nd to 5th grade. Road runners is an endurance building, running/ walking program with the goal of instilling in kids the importance of making health and fitness a regular part of their lives. Students also set goals and then try to meet those goals each week. Parents are welcome and encouraged to run or walk with your child. The High School Cross Country team also comes to the elementary school to run with the younger kids. This year there are over 70 students in the Road Runner program and they stay after school on Wednesday. 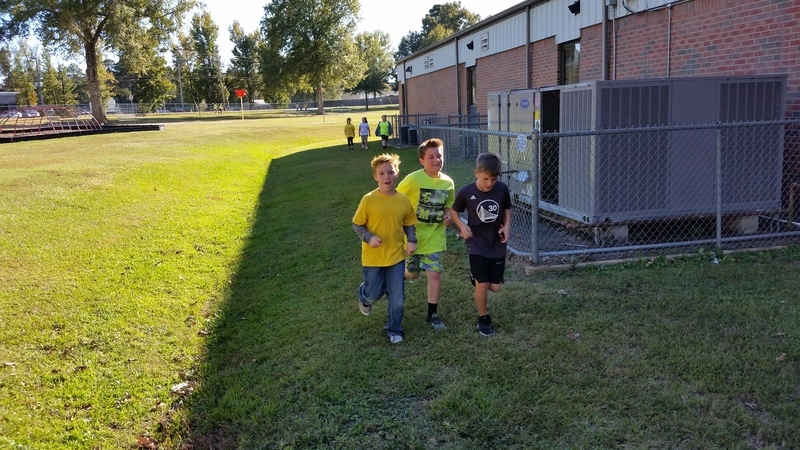 After passing out snacks, taking attendance, and a few warm-up exercises the students go outside and run or walk around the elementary playground. The course they use is ½ mile. Each time they go around the playground they get a stick. The sticks are counted at the end of the day and each runner’s smile-mile card is punched according to how many sticks or laps he or she has run. When students receive 10 punches (5 miles) they get their first toe token, which is worn on the shoe. After 20 punches, which completes the first card, runners will get a toe token and a 10 mile certificate. Each time they complete a milestone (5,10,15…miles) they will receive a toe token and/or a certificate. Many of our Road Runners set a goal of running 26.2 miles or the total length of a marathon. Runners can sign up to run their final mile in Little Rock at the Little Rockers Marathon. Students from all across Arkansas in similar running programs like Jimmy Brown’s bring their students to run in the kids one mile race during the Little Rock Marathon race weekend. The program at Jimmy Brown was started about 6 years ago as a morning program but when it was moved to the afternoon two years ago it became incredibly popular. We had 5 students run in the kids final mile at the Little Rockers Marathon in 2011. Last year the group had 37 signup to run in Little Rock. It is a great program that students look forward running. Running adds years to your life and life to your years!